www.myspace.com/jayparrack-www.jayparrack.co.uk Wonderful singer, friend and musician. www.adrianfreedman.com ... Sacred Japanese Shakuhachi flute. www.miagolding.com ...my daughters website. Art,design, natural handmade skincare. wwwww.mandalascapes.com ... Stunning Mandalas saturated in glorious colours. 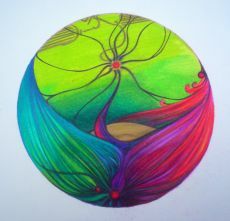 www.Aura-Soma.net ...Colour Therapy for the Soul. www.colourmirrors.com ...Colour Therapy for the Mind,Body and Soul. www.dolphinsmile.org ...a link to the world of the dolphins, by a man I met in Hawaii. www.cominghometolemuria.com ... a book written by a friend, with the cover circle created by myself. www.bhaktitribe.net ...'Ancient waves' a magical improvised cd of global musicians.I sing on track 9.
www.wholebeing.org ...'The Oracle of Illumination' .Colour and Numerology.Book and set of cards. www.highvibrations.net...Joy Gardner,Vibrational Medicine,Sound Healer and Author -Hawaii. www.soundintentions.com ...Musician,Sound Healer and Photographer. www.survivalinternational.com ...The Global movement for tribal people. Preserving Indigenous Tribes.